I’m the mom of a 19-year-old. A 19-year-old that goes to college 5 hours away, involving a drive over two mountain passes and through metro Denver traffic. He’s a good, cautious driver and patiently puts up with my “be safe, make good choices” talk every time he gets behind the wheel. He texts me when he leaves, he texts when he arrives. He never gives me reason to worry, but I just can’t help it. 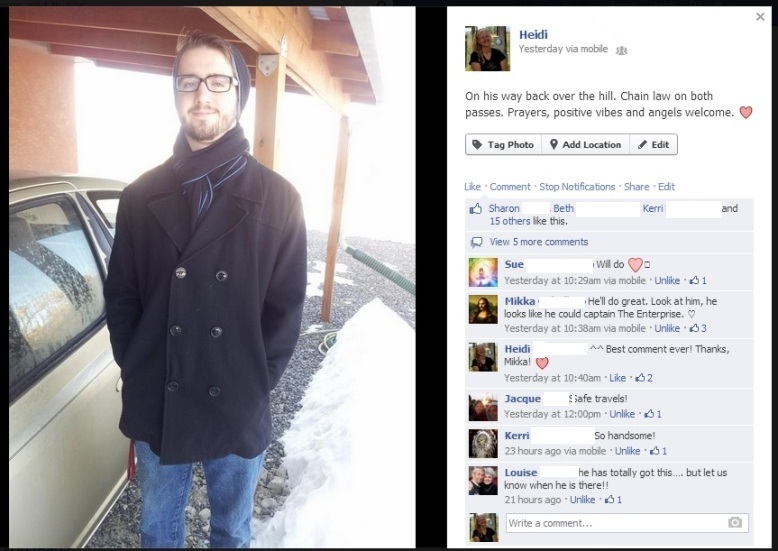 He left yesterday, knowing that Vail Pass was closed due to a jack-knifed semi and chain law on both Vail and the Tunnel. (I worry when roads are dry!) I’m grateful for my network of Facebook friends, some of whom have college drivers of their own, who provide a positive energy, prayer and angel network when my boy is on the road. I still worry until I get his text, but this network brings more comfort than I know how to express. I’m a lucky mom. 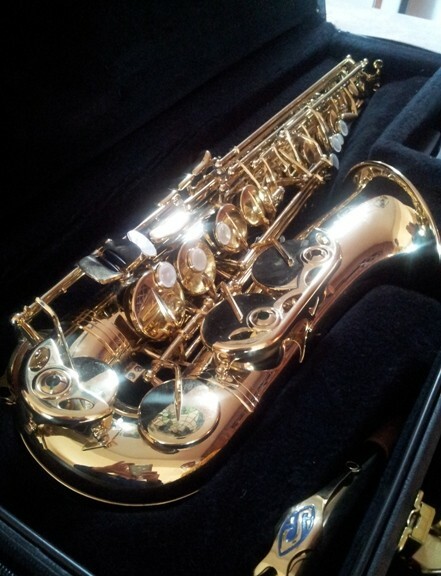 My son found his passion for music in middle school, and that passion has given his life focus. He’s currently pursuing a double major: music education and saxophone performance, and has plans to continue on to grad school. Music is like air to him–he absolutely needs it to be himself. Music saturates his essence. I’m endlessly grateful for the way he follows his passion. I’m grateful for the clear and realistic path he has set, allowing for flexibility but never losing sight of the music. Skillful in so many ways. Everyday home cooking is usually a job for one. I am that one. She who chops and cooks and makes a mess and then cleans up. I don’t mind, because I love to cook. Last night, Michael was in the mood for pizza and joined in the preparation. 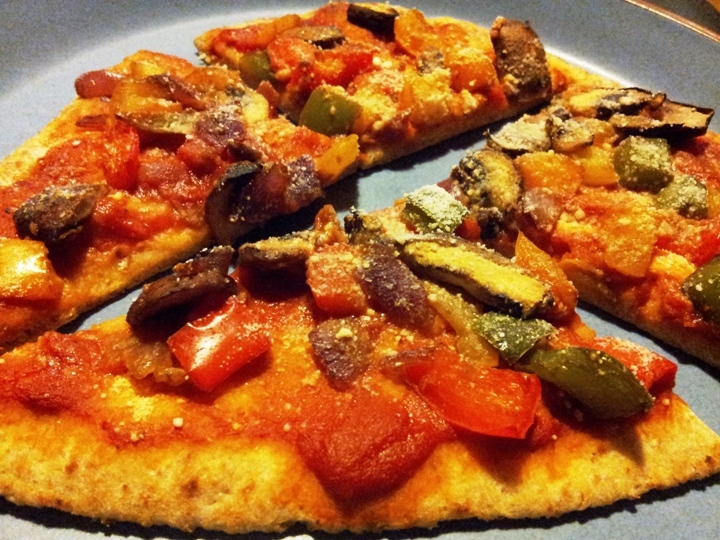 Just a simple vegan pizza with a naan bread crust, but so much better for the wine shared and the joint effort to create it. It reminded me of our dating years when we often made meals together, drinking wine and laughing. I’m grateful for a hubby who is comfortable in the kitchen. Food made with a loved one always tastes better. Spring has tulips and cherry blossoms, Summer has sunflowers and petunias, Fall has goldenredburgundy leaves. And winter? Christmasy reds and greens, crystalline white snow and crisp blue skies. Every January, I clear my house of the cozy green and red of Christmas and replace it with crisp and clean blue and white. Always displayed on my hutch, is the bridal “china” my Mom insisted I have. 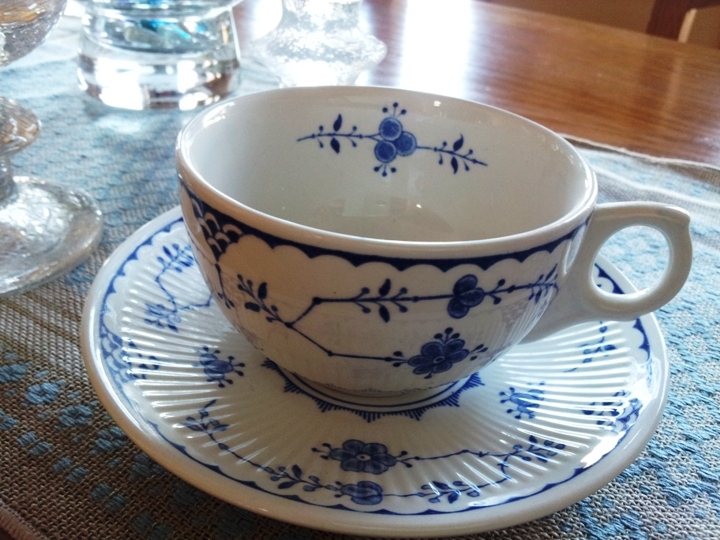 I had my choice of patterns (within monetary reason) and selected one that sang to my Scandinavian side. One that my Danish Great-Aunt would have loved. It’s a stoneware rather than china; far more practical and definitely used more often because of it. Made by Franciscan, the pattern is called Denmark. I’m so grateful for this reminder of Mom and my heritage. The fresh colors of January. It’s a cold, gray day here in Western Colorado. The kind of day that has me jonesin’ for the first bit of warmth riding in on the wind. That little breath of hope serenaded by meadowlarks and celebrated with little bits of green pushing up from thawing earth. On days like this, I’m grateful for seeds and the plants they become. I’m grateful they continue to grow inside while the world outside freezes. Do you remember those childhood science experiments of growing the “trash” parts of plants? Like carrots and sweet potatoes and such? 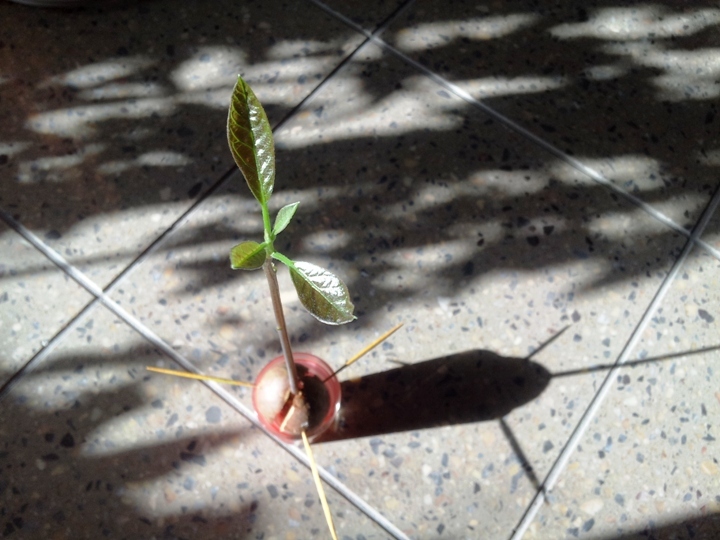 I’m forever trying to grow an avocado tree. This time it finally worked! A seed suspended in water actually sprouted roots, a stem and finally a spray of leaves. and so new at the same time. 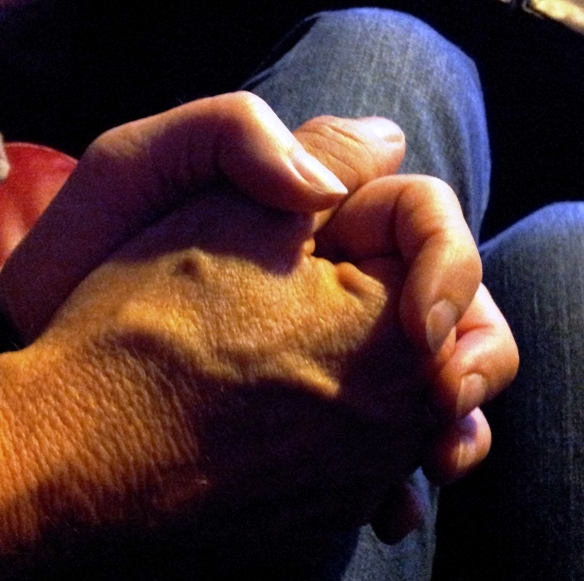 I’m so grateful for those times I can sit quietly and hold hands with Michael. There may be distractions of the TV or Pookie the cat or the phone ringing, but my world is only him and me at those moments. Yesterday on Facebook, I came across a post about the 365 Grateful Project. The woman who started it posted pictures of things she was grateful for to Flickr every day for a year. As the year went on, she felt happier and more content. She noticed little things that her busy life had prevented her from seeing. In effect it slowed time, allowing her to experience wonder. I like the idea of spending more effort on wonder than on stress and worry and guilt. But 365 posts? My lazy self thinks not. I will, however, keep my eyes wide open to all the perks of my life and make a bigger effort to be thankful that they exist, no matter how small, and post about them occasionally. I have many, many things to be grateful for. Some very big things that influence my life in fabulous ways, but today I wanted to start with a small thing. Something that is no big whoop, really. But something that makes me smile. Something that brings a bit of happy to my day when I see it. Things that Glitter, Sparkle and Shine. Like sun glinting off snowflakes. Houses lit for Christmas. Sparkly jewelry. Shiny appliances. Fairy dust. The way a person’s eyes shine when they’re happy. 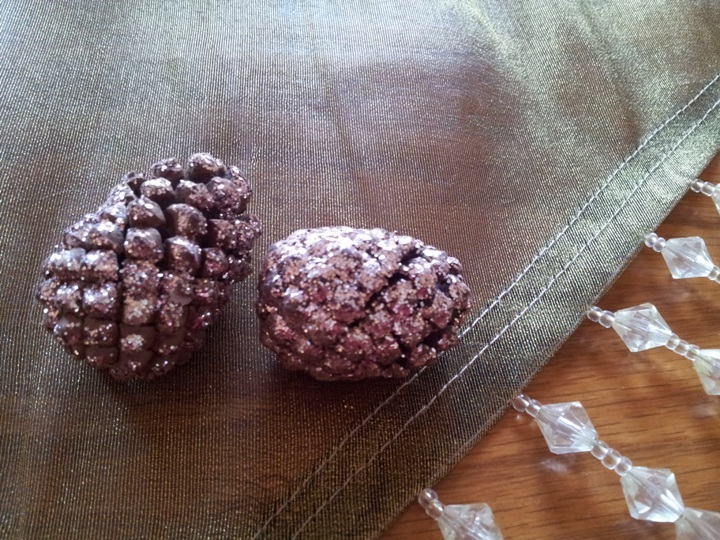 I’m so grateful for whoever first decided that the combination of glitter and pine cones was a good thing. I’m ready to box up my Christmas stuff for another year and was looking at these cones this morning as I sipped my coffee. They made me smile, and I knew I had a gratitude post for today. Nothing epic, nothing life-changing, but certainly something that makes my life a wee bit happier. 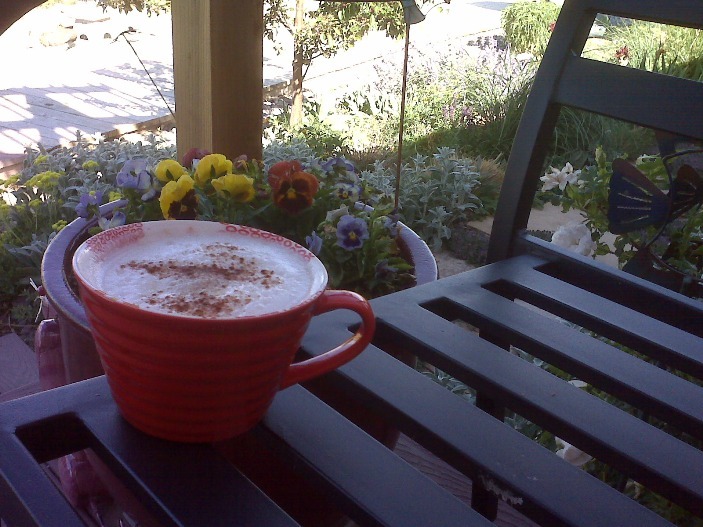 Sometimes even the small things….